Preview: Letter R Activities that would be perfect for preschool or kindergarten. 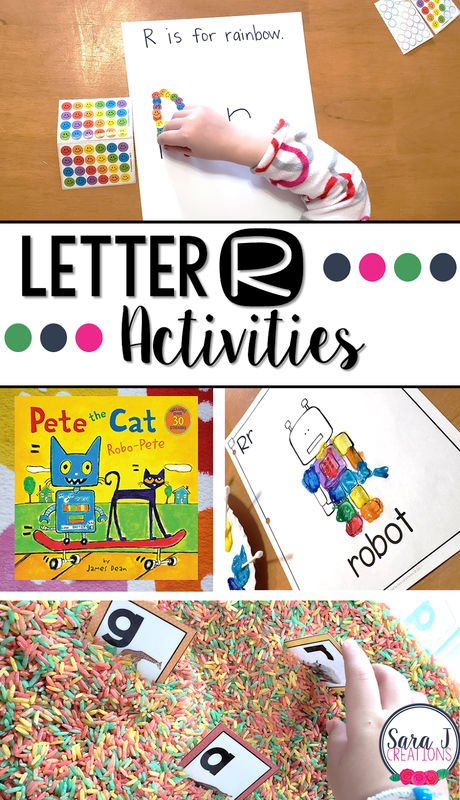 Art, fine motor, literacy, and alphabet practice and more all rolled into Letter R fun. This week in our weekly alphabet study is the letter R activities. We had some handwriting practice, literacy fun, art projects, fine motor practice and alphabet review games. Check back each week for more alphabet fun! To start our study of the letter R and a week of fun activities, we read the book Pete the Cat Robo-Pete by James Dean. We love Pete the Cat so this was an instant hit. We talked about how the word robot starts with R. Then I showed my daughter what an R looked like in the book and we searched for other R's. I made sure to pick a book that matched the picture that we would create next for our alphabet art book. 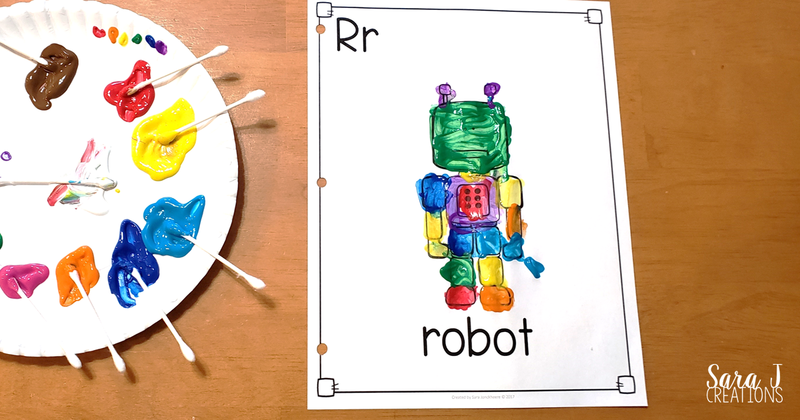 For the alphabet book we are working on, we added R is for Robot. We used Q Tips and Crayola washable paint to paint the robot. This was great fine motor practice too as she dotted and then smeared using the Q Tips. 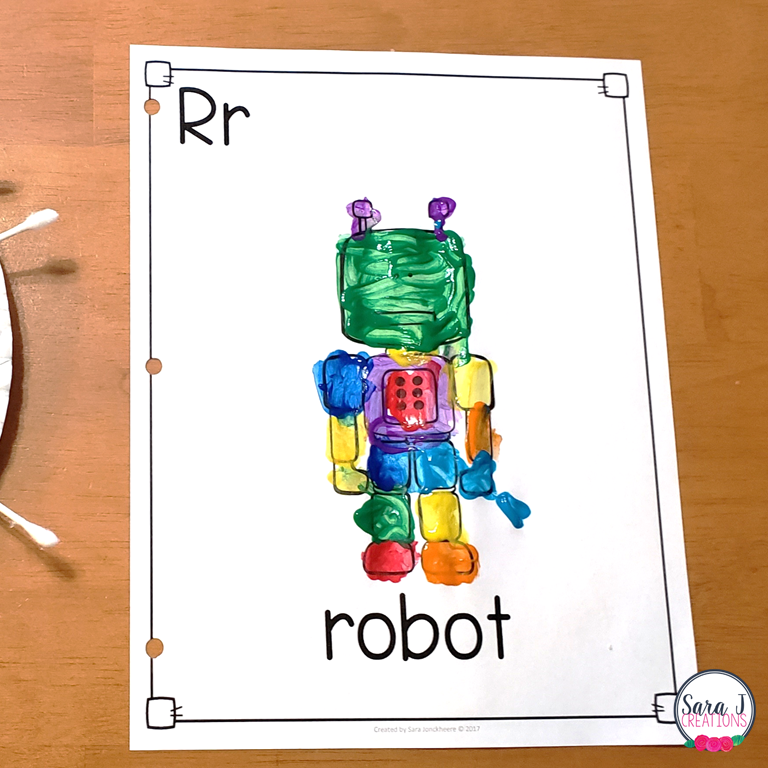 And of course she wanted to turn the robot into a rainbow robot.The alphabet book is part of my Alphabet Centers with Real Pictures. To practice writing the letter R, I put our alphabet tracing sheets in a reusable plastic sleeve and gave her a dry erase marker. Now that we are in our routine, she easily works on this and the letter identification task without any help or prompting from me. I just leave it on the table and she knows what to do. We practiced identifying the letter R in all different fonts with our R page from our Alphabet Centers pack. We kept out our Q Tips and washable paint to color in the letter Rs on the page. This was a nice change from our dot markers that we usually use. For some fine motor practice, I wrote the upper and lowercase R on a piece of white paper. Then I gave my daughter small rainbow colored stickers and had her practice peeling them off and lining them up on the letters. If you want to make this easier, you can remove the white part that is around the stickers so it is just the stickers and the backing. This makes it a little easier for little fingers to pick off the stickers. For a sensory bin we did rainbow rice. The easiest way I've found to dye the rice is put it in a gallon size ziploc back with a few squirts of hand sanitizer and a few drops of food coloring. Smush it all around and then let it dry on a cookie sheet. So easy, dries pretty quickly and you don't have the lingering vinegar smell that other recipes give you. We also grabbed our what letter comes next boards from my Alphabet Centers with Real Pictures and I put some of the letters into our sensory bin. My daughter practiced going through the letters and looking for the missing letter. She grabbed an alphabet chart to help her, because sequencing letters is still tricky. I was so proud of her for remembering that we have these alphabet posters (a freebie from my alphabet centers) hanging in our playroom so she would go check when she was trying to remember what animal started with each letter. To review all of the letters we've covered so far, we played some Spin and Cover games. These are from my Alphabet Centers with Real Pictures and are so easy to just print and play. We use a paperclip and a pencil as a spinner and then take turns spinning and covering the letter we land on. The person that covers the last letter is the winner. We also pulled out my robot freebie to practice beginning sounds. This was a little tricky since there are two sets of the alphabet included. I pulled out one set and she grabbed an alphabet chart to help her. Her big sister came home from kindergarten while we were working on this, so she used the other set and practiced matching the letter and the picture.